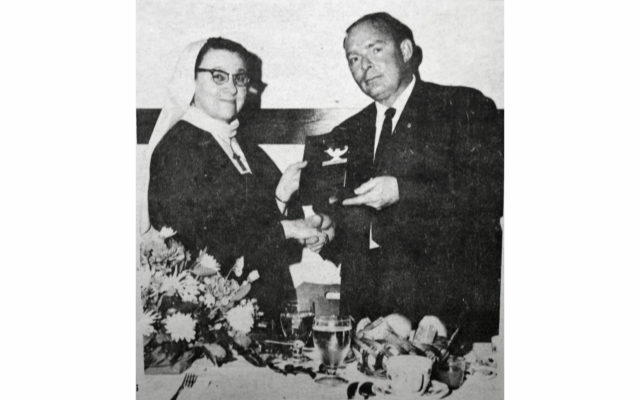 Awarded For Her Calm Thinking At Robbery — Miss Francoise Grondin of St. Jacques received an engraved plaque and wrist watch from Clement Brennan, regional manager of Co-operative Insurance Services. Miss Grondin was presented with the award in recognition of her courage and quick thinking last August when three bandits entered the St. Jacques office of the Credit Union. As the men entered the building Miss Grondin locked the safe behind her and save $600 of the Union’s money. St. Agatha Num Marks 50 Years — Sister Jean Marie Due Carmel was honored with a Mass of Thanksgiving for the 50 years of religious life. Sister Jean Marie has been serving in St. Agatha from 1930 to 1953 as a music teacher and from 1959 to present as parish Sacristain, an organist. 2,000-Year Old Rites Of Ordination Grace the St. John Valley Again –– The Most Reverend Joseph Gerry, O.S.B. Bishop of Portland, present the Holy Eucharist to newly ordained priest, Rev. Claude Gendreau. Gendreau, born in Grand Isle, schooled in Madawaska and raised in St. David, was ordained in a bilingual ceremony before a packed St. David Church Saturday. Bye-Bye, Jack — One of the St. John Valley’s best known bankers, Jack Michaud of St. Agatha, has announced his retirement, effective June 5.Michaud began his career with Northern National Bank in 1963. The name of the bank changed to Casco Northern Bank in 1991 and recently to KeyBank. Michaud said he has a well-equipped workshop, a garden and he looks forward to going fishing. 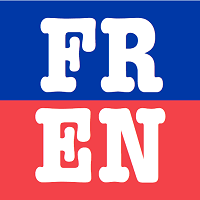 Madawaska To End French Immersion Program — Superintendent Paul Malinski was quick to say that a new approach to teaching French in the Madawaska Elementary School is intended to increase all students’ knowledge of French. Previously, parents of elementary students could sign their children up for a “French Immersion” experience, where instructors would teach classes like science and math using the French language.